Taman Alam Lumbini or Lumbini Natural Park is located in Berastagi – North Sumatra, Indonesia. The park doesn’t only have a ‘park’ inside the complex, but also a quite big pagoda inside the complex. In fact, the pagoda itself stole my attention in the moment my friends and I arrived there. It’s almost 4 PM (if I’m not mistaken) when we reached the area, and we were there until the park was closed around 6 PM. It seems that it took a long time for us to just exploring this place, but for us, 2 hours is not enough. 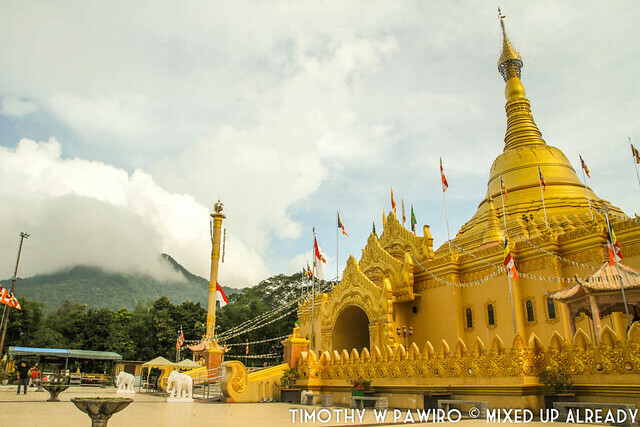 When I look at the pagoda, my first impression that it looks like a pagoda from Myanmar or Cambodia, but not from Thailand. But then I saw a white elephant sculpture on one of the walls in the complex which made me hesitate of what I thought earlier. Apparently I was right! 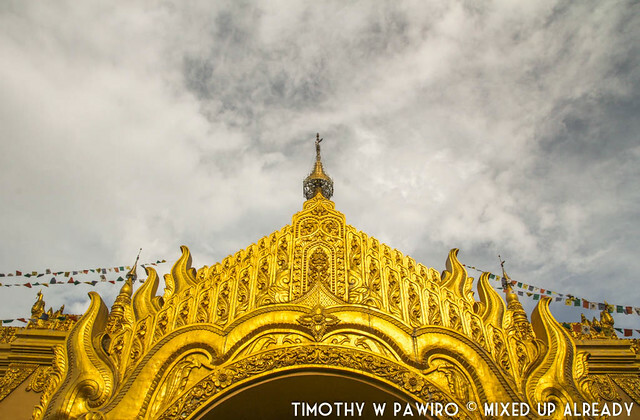 This pagoda inside the Lumbini park is actually a replica of Shwedagon Pagoda in Myanmar. 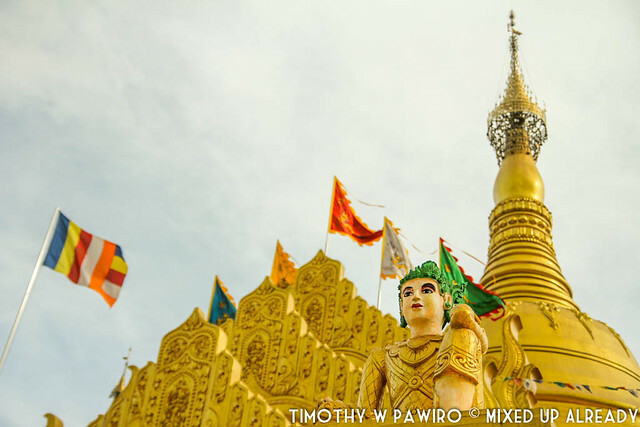 The name ‘Shwedagon’ is formed from two words, ‘Shwe’ that means ‘gold’, and ‘Dagon’ is the previous name of Yangon – the capital city of Myanmar. Thus, ‘Shwedagon’ means the golden pagoda in Dagon city. It took me quite a while to walk around the pagoda to admire and amaze the design and the golden colour of the pagoda. Love the architecture, design, and the details of the building! Usually when I exploring a temple or a pagoda, it seems the weather is always hot haha (but not always), but Lumbini park is different … It has a cool weather, as it’s located in Berastagi at the Karo highlands. When we visited this place, there was no event at that time, so we could freely go inside the pagoda without disturbing anyone. 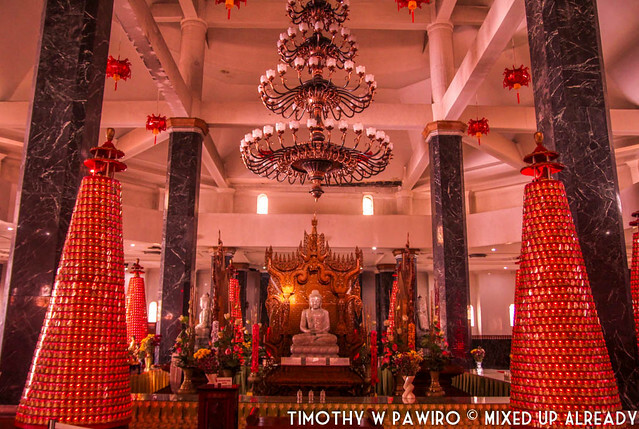 There are four Buddha statues facing the four directions inside the pagoda which are placed at the centre of the pagoda. Around the statues there are four mini cone-towers that if I look closely consist of mini statues of Buddha. After I looked around of the pagoda, I didn’t remember that I actually visited the ‘park’, and I haven’t gone to the park yet! Lol … Then my friend (was it Kania?) told me that the rest of our friends were at the park just beside the pagoda complex. 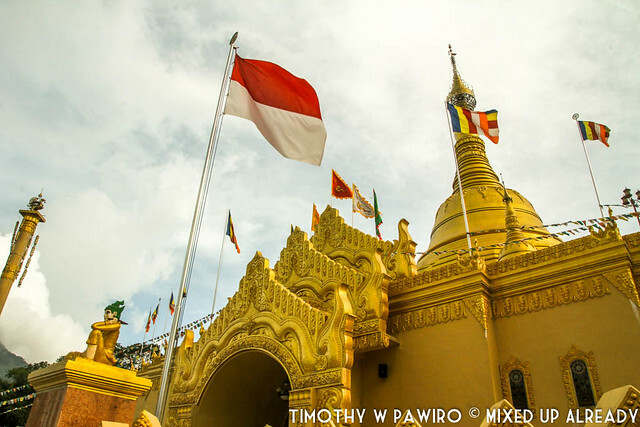 We’re heading to Indonesia next week and we might add this pagoda to our travel list. Fascinating place to explore. We’re both big fans of temples and Buddhist monasteries. Ya lah Feb. Aku tak pernah ke Myanmar lagi, jadinya aku ke sini saja lah ya. Haha. 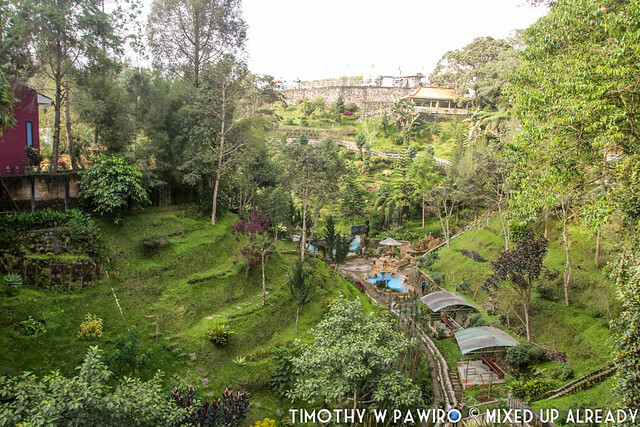 But Tim, the place really look amazing and the park? It is marvelous!! Foto-fotonya kerennya kebangetan! Thanks for sharing. This is so great! 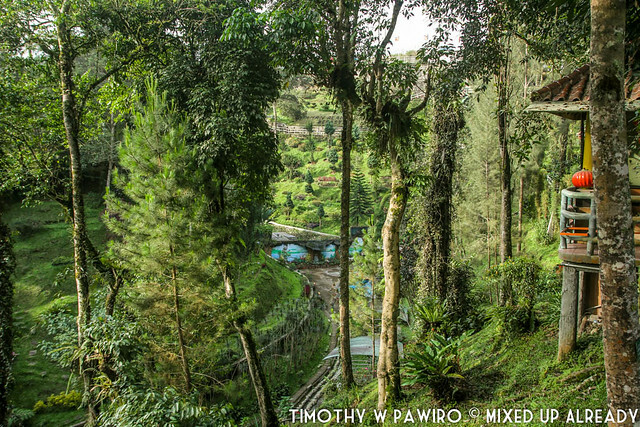 Love love the photos – will have to remember this place for future visits. Yes, the place is really great! Kl di Thailand menurut oom Google namanya Lumphini Park … Mirip2 haha!! Baiklah, karena belum kesampaian juga mau kelayapan ke Myanmar, kayanya set target buat main kesini dulu deh. Keren tempatnya. BTW gimana kondisi nya sekarang ya? Apakah kena impact Sinabung? Would just like to know how to get there if I will be coming from Bali? with lots of details about the particular subjects protected complete. in this sensible approach, exhibiting us all unique features for it. Please continue the good work. When i cannot hold out to learn to read whats next.